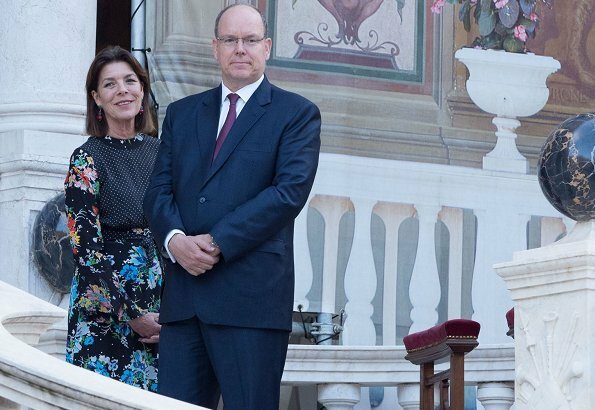 On the occasion of the Feast of Corpus Christi, On May 31, Prince Albert of Monaco and Princess Caroline greeted the arrival of the procession from Galerie Hercule in the Main Courtyard in the Palace of Monaco. 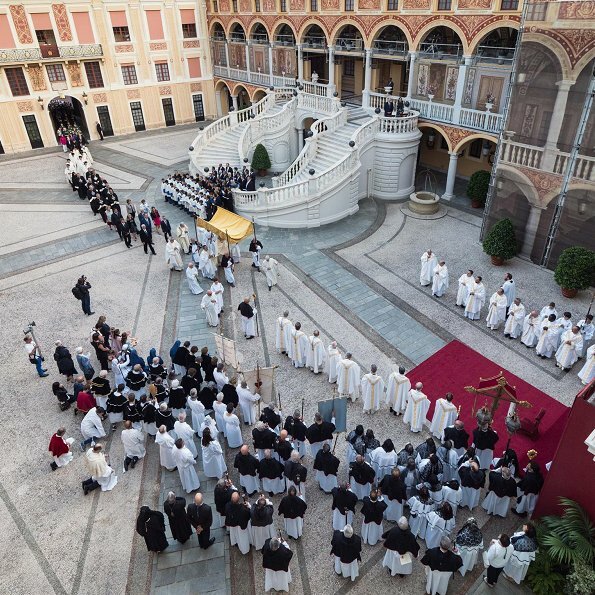 The Feast of Corpus Christi (Fête-Dieu in French), also called the Procession of the Blessed Sacrament, is a Roman Catholic feast celebrated on the Thursday following Trinity Sunday (i.e., sixty days after Easter). Nice to see Caroline again - I like the dress, it's a bit off the wall but I like the mix of pattern and colours. There is to much going on in this pattern,but it looks good on her,the dress is light perfect for the season. 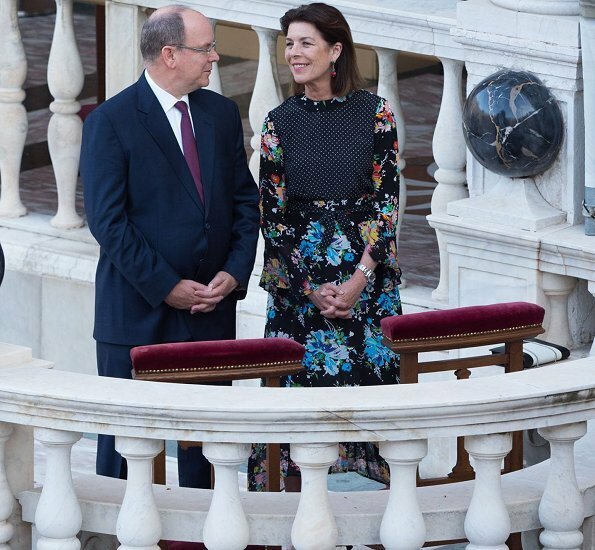 Prince Albert and Princess Caroline of Monaco look very close siblings. Caroline looks like a flower-power-girl from the 1960s and early 1970s………but still very, very beautiful! 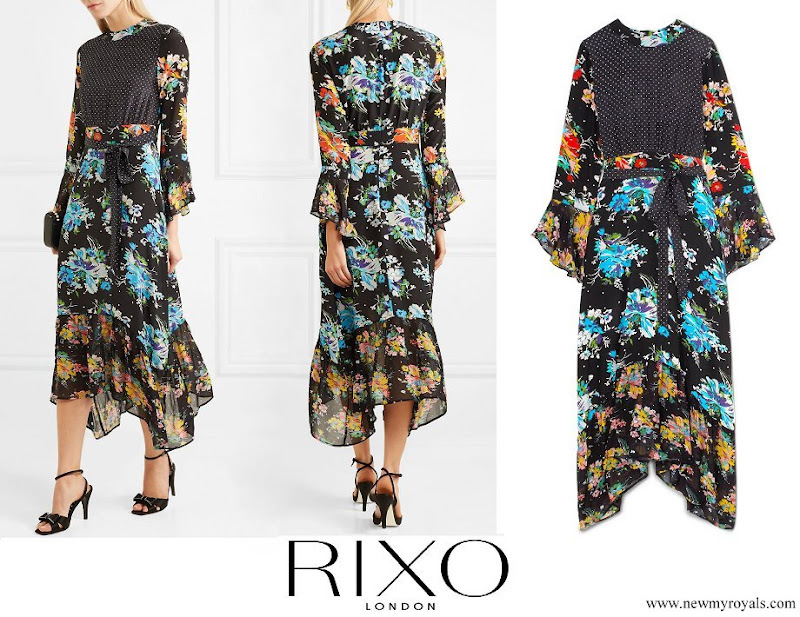 I like the dress - the subtle mix of the dotted print with the floral makes it edgier than the usual florals we see this season, but it's still subdued enough for the occasion. This is not a "granny" floral, in my opinion. I would totally wear it and I'm older than Caroline. My eldest daughter is, and has always been, very like princess Caroline, apart from the colouring. It is peculiar, because neither her father or I are at all like her parents! She looks very nice here, I like her dress! 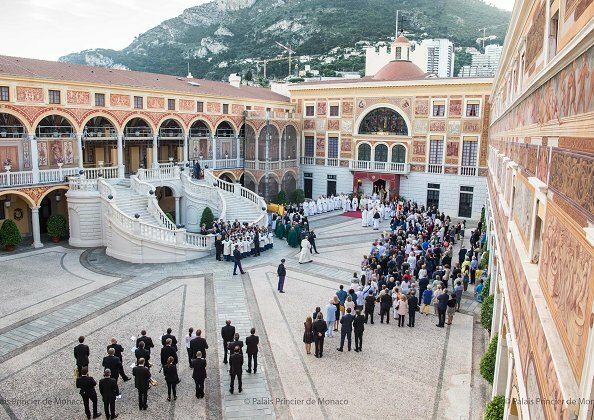 I don´t care much about the dress, but that palace in Monaco is spectacular, looking almost a bit oriental. Very pretty! I've always had a weakness for a "hippie"/prairie vibe, and this dress manages to combine that with a neat and tidy look. Quite a feat, and a great way to show that that style can work on a mature woman. Love Caroline and love her dress!! So pretty!! Caroline is such a beautiful woman, and so is her daughter Charlotte. But Caroline seems to be much more friendly. Caroline's dress is not a style I could rave about. Many years ago both Caroline and Charlotte were superlative in their choice of elegant designer fashion and the personal style they put with it. Somehow what they both had years ago, they have lost. Photos from years ago of the two women will illustrate what I have written. Sorry, don't like the front of Princess Carolines dress, but love to see her again with her brother! Agree with Coralie that Caroline seems she is more friendlier than Charlotte. ze hebben nog steeds goede familie band !!! Interesting, where there is Caroline, there isn't Charlene. Or... where there isn't Charlene, there is Caroline.